The boss was asked for an update on the situation with the Spain international at a press conference to mark Liverpool's fourth trip to Thailand. Speaking to a packed conference room at the team hotel, Rodgers said: "It was obviously a difficult decision. "From last season, really, as a manager I was led to believe that we were going to get an offer for Pepe that would probably see him leave the club. "On the football side, we have to protect the team, and at that stage we started our search for another goalkeeper. "That found us Simon Mignolet, who's top class - one of the top young European goalkeepers. 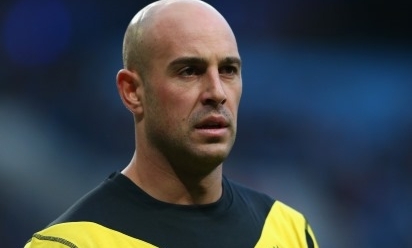 "As events transpired, that move [for Reina] didn't happen and it left us with two very good goalkeepers. Both would have been fighting for the No.1 position. "Then obviously an opportunity arose for Pepe and it was one we felt as a football club was best for him to take. "As a senior goalkeeper, he needs to be playing. It's a very important year for him with the World Cup next year. It wouldn't have served any purpose, both for the club and him personally, if he'd been the one missing out. "It's decided he will go to Napoli and we've got two very good goalkeepers still at the football club. "We'll review it after the loan finishes."